Look, I’m not a climate scientist, but it’s pretty obvious the NSW election was all about putting NSW Labor out of their (and everybody else’s) misery like the pack of mangy, rabid, parasite-infested mongrels they so clearly were (too kind?). Bit difficult to read much more into it, though I’m sure that won’t stop anyone. Great cartoon. Very true. 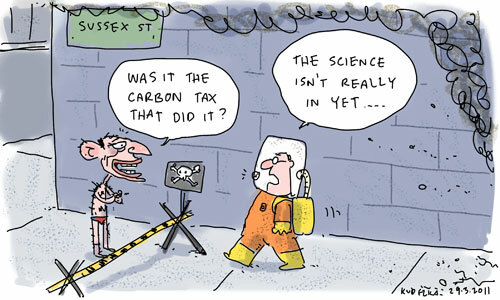 Did you see the reports a lot of the ballot papers in NSW had NO CARBON TAX written across them? Gillard reckons people didn’t vote with the carbon tax in mind and Bob Hawke said yesterday the carbon tax had to have an impact. At least Hawke acknowledges what’s going on in the real world. Have a great day and keep up the good work. Bernie. It’s important to be quite selective when you acknowledge what’s going on in the real world, I’ve found. Got a link to those reports?